The Beachcomber Hotel Toukley - PH : 0243971300 Book Direct 2 Save. Standard Hotel room for two. Contains one Double size bed and some with a single sofa. FREE Off Road parking subject to availability. Book Friday & Saturday in a roadside and receive Sunday FREE! Includes daily hotel breakfast for two, three nights accommodation, 2 x drink vouchers & 2 x cook your own BBQ packs for Sunday bands. Standard Hotel room for two. Contains one zip lock King size bed or 2 Singles and a outdoor garden view area with views over the pool. FREE Off-Road parking- subject to availability. Standard Hotel room for two. Contains one zip lock King size bed or 2 Singles and a outdoor garden view area with views over the pool. FREE OffRoad parking subject to availability. Standard Hotel room for two. Contains one zip lock King size bed or 2 Singles and a outdoor garden view area with views over the pool. FREE OffRoad parking subject to availability. Breakfast included for 2 person. Standard Hotel room for two. Contains one zip lock King size bed or 2 Singles and a private balcony boasting stunning views over Budgewoi Lake. Standard Hotel room for two. Contains 2 Single beds and a private balcony boasting stunning views over Budgewoi Lake. Standard Hotel room for two. Contains 2 Single beds and a private balcony boasting stunning views over Budgewoi Lake. Breakfast includued for 2 person. Standard Hotel room for two. Contains one queen size bed and a private balcony on the roadside. FREE Off-Road parking- subject to availability. Relax in one of our spacious Spa Rooms with a Queen size bed and a Single person Spa bath. You have a private balcony with boasting beautiful views over Lake Budgewoi. Relax in one of our spacious Beachcomber Rooms with a Queen size bed and large two person corner spa bath. Room has a private balcony boasting beautiful views over Lake Budgewoi. Relax in one of our spacious Beachcomber Rooms with a Queen size bed and large two person corner spa bath. Room has a private garden area with views over the pool. Relax in one of our spacious Beachcomber Rooms with a Queen size bed and large two person corner spa bath. Room has a private garden area with views over the pool. Breakfast for 2 person. Standard Hotel room for two. Contains one queen size bed and a private balcony on the roadside. FREE Off-Road parking- subject to availability. Includes a light breakfast bag for two on arrival Sunday Thursday or a hot breakfast for two Saturday -Sunday mornings ONLY. FREE Off Road parking subject to availability. Standard Hotel room for two. Contains one Double size bed and some with a single sofa.Includes a light breakfast bag for two on arrival Sunday Thursday or a hot breakfast for two Saturday -Sunday mornings ONLY. FREE Off Road parking subject to availability. Standard Hotel room for two. Contains one zip lock King size bed or 2 Singles and a outdoor garden view area with views over the pool. FREE Off-Road parking- subject to availability.Includes a light breakfast bag for two on arrival Sunday Thursday or a hot breakfast for two Saturday -Sunday mornings ONLY. Standard Hotel room for two. Contains one zip lock King size bed or 2 Singles and a private balcony boasting stunning views over Budgewoi Lake.Includes a light breakfast bag for two on arrival Sunday Thursday or a hot breakfast for two Saturday -Sunday mornings ONLY. FREE Off Road parking subject to availability. Relax in one of our spacious Beachcomber Rooms with a Queen size bed and large two person corner spa bath. Room has a private balcony boasting beautiful views over Lake Budgewoi. Includes a light breakfast bag for two on arrival Sunday Thursday or a hot breakfast for two Saturday -Sunday mornings ONLY. FREE Off Road parking subject to availability. Experience a romantic night's accommodation in one of our waterfront rooms with a bottle of sparkling wine & strawberries on arrival. 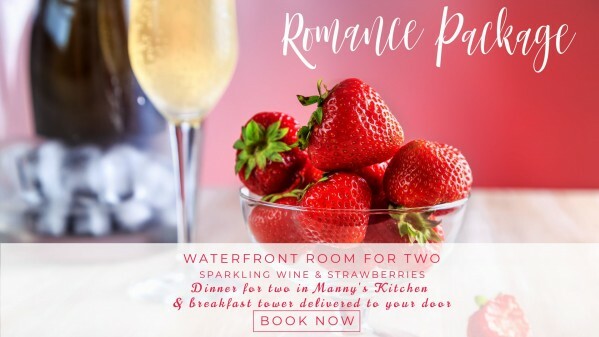 Includes a dinner for 2 in Manny's Kitchen and enjoy a delicious breakfast tower for 2 to share on your waterfront balcony. Relax in one of our spacious Spa Rooms with a Queen size bed and a Single person Spa bath. You have a private balcony with boasting beautiful views over Lake Budgewoi. Includes a light breakfast bag for two on arrival Sunday Thursday or a hot breakfast for two Saturday -Sunday mornings ONLY. FREE Off Road parking subject to availability. Waterfront Spa room with a bottle of wine, strawberries and chocolate with a relaxation pamper pack for you to enjoy in our waterfront double spa room. The Beachcomber Hotel offers resort-style three-and-a-half star accommodation in the heart of the NSW Central Coast just north of Sydney and south of Newcastle. As well as being located on the water's edge of Lake Budgewoi, The Beachcomber is just minutes from beautiful beaches, nature reserves and some of the most picturesque scenic views you'll see whilst visiting the area - such as Norah Head Lighthouse and the daily pelican feeding nearby at The Entrance. If you love the beach, you'll love Lakes Beach and Soldier's Beach just minutes from your room. If you're a golfer, you can tee off at three golf courses within a 15 minute drive of Toukley: Toukley Golf Club, Kooindah Waters and Magenta Shores. And with the fifteen local bowling clubs such as Halekulani, Toukley Bowling Club, and Diggers at the Entrance as well as the hundreds of other Central Coast attractions within a short drive of The Beachcomber Hotel which is fantastic for visitors whether you surf, golf or bowl. And if you're into waterskiing, fishing, scuba diving or bushwalking, the northlakes end of the Central Coast offers great opportunities for each of these activities. For staying in and relaxing, The Beachcomber Hotel has a 20m swimming pool and spa. All rooms are fully air-conditioned, with most rooms boasting king-size beds and private balcony. There are also spa rooms available. The Beachcomber Hotel hosts one of the Central Coasts top nightspots, the "underground" nite-club on Friday evenings The Beachcomber is an entertainment venue, and noise can be expected. Reception Hours : Monday - Saturday: 9 AM - 5 PM. Sunday & Public Holidays: 9 AM - 11 AM. After Hours : Through the hotel main bar up till 10pm or self check in for after hours. The Beachcomber Hotel offers a range of facilities including 5 Function rooms available for conferences, parties wakes or weddings. We supply all standard AV equipment and catering is available if required. Special accommodation rates can be organised for conference booking. Please contact reception for more information. Car Parking : A multi-level carpark is available for all hotel guests, no designated spots are allocated. Getting There : The Beachcomber Hotel is easily accessible from the free-way. Use the Warnervale/Toukley exit onto Sparks Road and you are only 10 minutes away on the left hand side! The local area is filled with outdoor activities for the whole family! Including Bush walking, pelican feeding at The Entrance, local rock pools, Norah Head Light House, children's play centers located within a 10 minute drive, local movie cinemas, ten-pin bowling, golf courses, great local surfing and fishing spots. 3 Large local clubs, golf clubs, Toukley tennis courts, skate parks, Toukley indoor pool, Canton Beach, Movie Theaters, Shopping Centres, hospital and doctors surgeries. © Copyright – The Beachcomber Hotel Toukley All Rights Reserved.